November 29th 1917. BATTLE OF CAMBRAI. A GREAT VICTORY. THE ATTACK LED BY TANKS BREAK THE HINDENBURG LINE AND ADVANCE FIVE MILES. On the morning of the 20th last the Third Army under the command of General the Hon. Sir Julian Byng delivered a number of attacks which were carried out without previous military artillery preparation and in each case the enemy was completely surprised. Our troops are now close to Cambrai. It looked as though the enemy suspected something a night or two ago when they raided our trenches and captured two or three prisoners. Had those men told anything? All was on the hazard of that. Most of the prisoners say that the first thing they knew of the attack was when out of the mist they saw the tanks advancing, smashing down wire, crawling over trenches and nosing forward with gunfire and machine gun fire slashing from their sides. The Germans were aghast and dazed. Many hid in their dugouts and tunnels and then surrendered. Only the bravest of them rushed to their machine guns and got them into action. Behind the tanks coming forward in platoons, the infantry swarmed cheering and shouting, trudging through the thistles while the tanks made a scythe of machine gun fire in front of them and thousands of shells screamed over the Hindenburg line. The battle picture was the most wonderful thing I have seen in this war. A number of tanks were on the battlefield resting awhile for another advance barely visible at any distance. I spoke to one of the pilots. ‘How are you doing? ‘We’re giving them merry hell, he said, ‘it is our day out. On one part of the battlefield I saw not one British dead. Credit for that is due to the tanks. 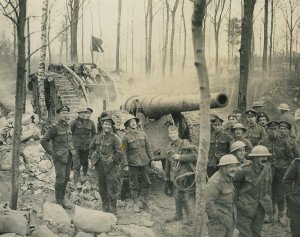 The distance covered by some of our troops on the first day was extraordinary, the men of one division going not less than 7000 yards. In a steady rain and wet mist I saw squadrons of them going into action and it was the most thrilling thing I have seen for many a long day in this war and one which I sometimes thought I should never live to see. They streamed by at a quick trot and the noise of all the horses hooves was a strange rushing sound. The rain slashed down upon their steel hats and all their capes were glistening and the mud was flung up to the horse’s flanks as in long columns they wound up and down the rolling country and cantered up a steep track – it was a wonderful picture – a scene to remember. This entry was posted in 1917, Uncategorized and tagged Battle, Cambrai, Cavalry, Hindinberg Line. ← Oscar Wilde’s Portora School.